OnSIP’s Larry Browne (center) with ITDRC cofounders Chris and Joe Hillis. 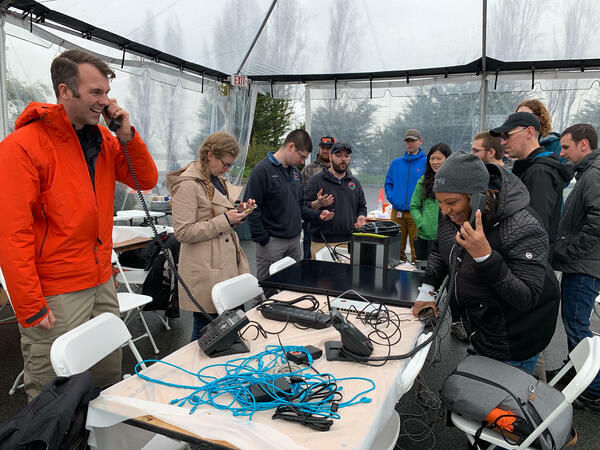 From February 25th through the 28th, 2019, the ITDRC’s Tech Task Force held a four-day conference in San Francisco to train volunteers in the disaster life cycle and to teach them about community needs in the aftermath, as well as the available equipment used in deployment procedures. OnSIP’s Larry Browne, a remote member of the ITDRC since 2015, relished the chance to meet the leadership team and other members who have responded to recently impacted areas like Puerto Rico and California. The primary goal of the workshop was to instruct volunteers on how to work swiftly and efficiently while getting communities back on their feet. 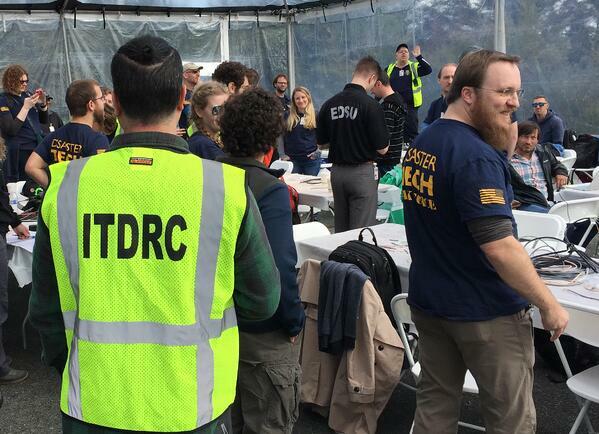 Beyond that, the ITDRC wanted to tighten relationships and cross-collaboration among the organization, volunteers, and partner response teams. Dustin Li presents critical communications technology inside the Cisco TacOps truck. Setting up OnSIP Polycoms with solar power and mobile tech. Partners like these are invaluable, especially as climate change makes disastrous storms the new normal. The ITDRC’s workload increases in tandem with climate change and the organization’s growing identity in the non-governmental response community. 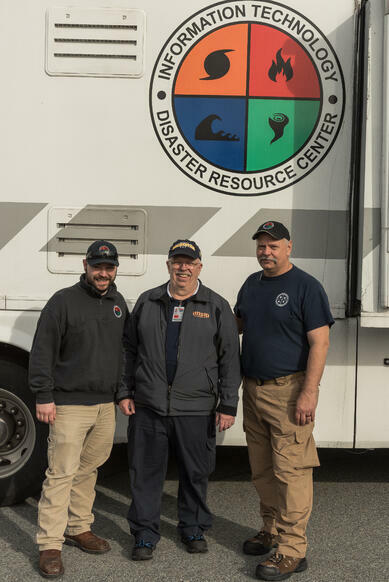 Cofounders Joe and Chris Hillis, together with the “Disaster Mom” Debbie Hillis, constantly crisscross the country to lend assistance to communities that need to rebuild their networks and communications after disasters sweep through. Google hosted the first two days of training at its downtown San Francisco offices, and Epicenter Media’s team, led by CEO Christopher Tarantino, facilitated. 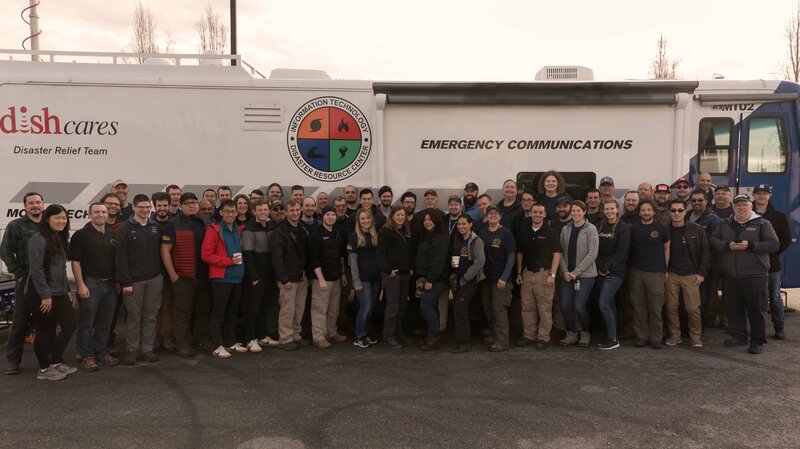 The sessions focused on disaster area communications skills, which included demonstrations and explanations of the various technologies that can be leveraged in these situations, as well as firsthand accounts from volunteers kind enough to share their experiences in the field. It’s always easier to learn through hands-on experience, so attendees were able to interact with comms and network hardware to familiarize themselves with the tech. 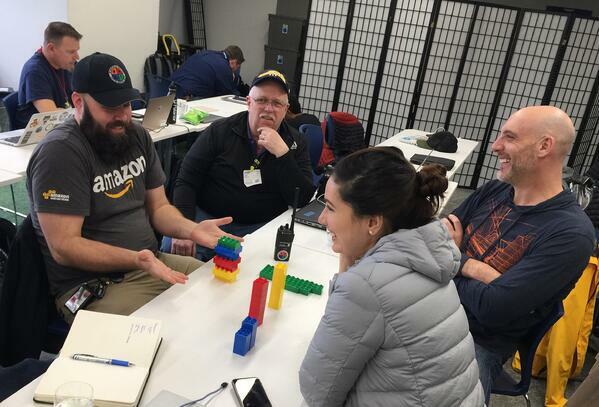 One exercise involved teams splitting in two, with one half building a structure from blocks and using only a radio to describe it to the other half in the hopes that through communication, each team could build an identical structure. Everyone was successful. Incident Commander Larry Browne (back right) leads a disaster scenario exercise. Larry and other volunteers participate in a communications exercise at the Google offices. When disasters strike, the concept of volunteering aid usually gives rise to images of emergency shelters, bottled water, and food lines while professionals work on getting power back. In the age of mobile devices and cloud technology, it’s easy to forget that when a disaster knocks out the power, that means communications are down, too. Power and data are two of the most important community needs in the aftermath of a disaster. Fortunately, the ITDRC is there to lend a hand.